As you know, there’s a vast array of mobile phones on the market today. So-called smart phones, that will take your photo, keep the photos of the kids and grand-kids, carry a recipe book, keep and play all your music, let you surf the web, check your email, read the latest best-seller …. But there’s one largely untapped part of the mobile phone market which is the market within which you, our primary target audience, resides. Many of you want to have a very simple, basic mobile phone. One that primarily makes phone calls! The Telstra Easycall 2 mobile phone is exactly such a phone. It’s not a camera, or a media player. You can’t surf the web with it, nor can you check email, FaceBook, or Twitter with it. And it’s not an ebook reader. 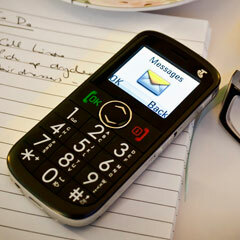 What it s though is one very solidly designed, basic mobile phone, that lets you make phone calls. And it’s specially designed with you in mind. Its buttons are oversized and clear. While the display is small when compared with phones like the iPhone, its size is comparable with other feature phones, and it displays its content brightly and clearly. These two features alone make it an ideal phone for those of you who are looking for a simpler, more basic phone, or for those who may have some vision impairments. In use, we found it very friendly.A slide switch on the side lets you easily lock or unlock the phone. Once unlocked, the big buttons, when pressed, respond with audio feedback confirming the number that you have pressed: press the number 2 and the phone confirms this with an audible “two” coming from its speaker. Phone conversations were clear at both ends of the call. The text messaging functionality, while somewhat basic compared with phones like the iPhone or an Android phone, was more than adequate. Setup is straightforward and simple, and it offers the usual range of pre-internet feature phone functionality options, many of which, I suspect, will go unused within this market segment anyway. And in this age of battery life where we commonly see smartphones failing to last a full work day on an overnight recharge, the Easycall 2’s battery just kept on going and going and going. Helping make this phone stand apart from the crowd, it sports a few extra features, like a dedicated button for making emergency calls, a built-in torch, an FM radio, and T-coil hearing aid compatibility. All in all, I think that – and especially at just $99 – this is a great basic phone for anyone, and it’s especially suit for those with vision or hearing impairments, or for those who simply want a a basic phone with basic functionality. ← How To Use A Mouse – Part 1.